Home LocalTalk Try Square Dancing for a Healthy, Happy New Year. Try Square Dancing for a Healthy, Happy New Year. A fun and easy way to keep your New Year’s resolutions: Get active, exercise your brain, have fun, and make friends! It’s time to try square dancing. 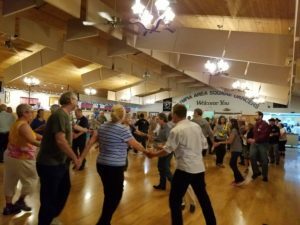 Olympia Area Square Dancers are sponsoring a Free Introduction to Square Dancing on Thursday January 11 at 6:30. 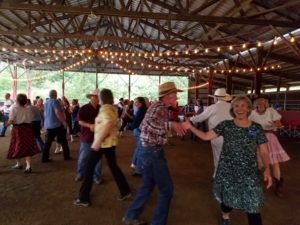 Olympia has a very active and vibrant square dance program, centered around beautiful Lac-A-Do Hall, 1721 46th Ave NE in Olympia. You will find dancers are there enjoying their favorite pastime almost every day of the week. You’ll be dancing right away at the Free Introduction – to music from all periods and all types. You will have so much fun, you won’t realize that you walk several miles in the course of the evening. And your brain is also getting an enjoyable workout. Recent research shows that this type of dancing may be the very best exercise for your brain. Couples, singles and families are welcome, ages 10 and up. Almost everyone can learn to square dance. The only people who may find that lessons are too fast-paced are those with moderate to severe developmental disabilities, or who cannot walk for 10-15 minutes at a time. For more information about this great activity, visit Olympia the Area Square Dancers website. Or call Ed at 352-2662 or Nancy at 438-1284. If you can’t make it to the Free Introduction, there can be other options.